How did you celebrate being a Best in Business Awards winner with your company outside the NBJ luncheon? We cheered in our office after the luncheon and then got back to work. How has the rapid growth of Nashville affected your company? We have grown exponentially with the growth of Nashville, and a sea change has occurred where more than 50 percent of our salaried staff are millennials. Describe your leadership style and how it has helped your company achieve its growth. We approach the construction business as a true service business. My leadership style of servant leadership means that we are always looking for ways to help our clients. What is your company’s best-kept secret to attracting and retaining talent?Encouraging and empowering are key attributes for retaining talent. What recent project are you most proud of, or which are you most excited for?We are excited to be constructing a 600-bed dormitory for Belmont University as it expands to meet its growing demand while also continuing our 15-year relationship with the university and its campus. We are also building Vanderbilt University’s E. Bronson Ingram College, which will become a landmark on West End Avenue and a focal point for the campus. What book are you reading now? I am reading “The Prize: The Epic Quest for Oil, Money and Power.” I love history, and this book tells the story of how oil has impacted the course of history for 150 years. When will Nashville’s building boom end, or has it already peaked? The real answer is yes and no. Nashville’s real estate market is comprised of several market segments that are each experiencing their own mini cycles. Certainly, multifamily project starts are slowing just as new office building projects are accelerating. Pitch your company’s culture (as if to a potential employee) in 10 words or less.We build great buildings and great relationships. How will your company look different in five years? Having served the Nashville construction market for several economic cycles over the last 76 years, we will not look too different except that I see the average age of our employee base continuing to be younger. You’re bringing in lunch for your employees: What do you order, and from where? 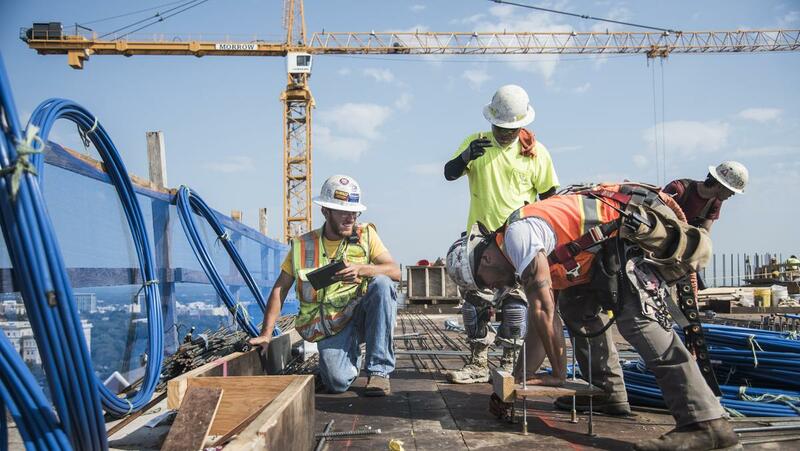 We are continually celebrating the topping out of many of our projects, and we love feeding over 200 workers on a job site with a barbecue feast from Jim ’N Nick’s and Famous Dave’s.